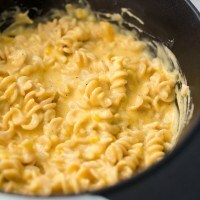 Stove Top Butternut Squash Mac and Cheese | Naturally.Stove Top Butternut Squash Mac and Cheese | Naturally. In this case, I prefer steaming the squash- no need to turn the oven on and you can use the same pot you are going to cook the mac and cheese in. However, the flavor of roasting can be a nice addition, so use the cooking technique you prefer. Start by cooking the squash by either steaming or roasting. To roast, preheat oven to 425˚. Toss cubed squash with olive oil and place in a roasting pan. Roast until squash is tender and starting to caramelize, 25 to 45 minutes (depends on how big of cubes you cut the squash). To steam the squash instead, heat a large pot with 1/2″ of water and a steaming basket. Add squash to the basket and cook until squash is tender. Once squash is cooked, place in a food processor and puree with enough water or broth until the squash is a smooth puree. Set aside. To make pasta, add the water and pasta to a medium sauce pan over medium-low heat. Bring to a simmer, stirring frequently so to separate the pasta. Stir in the milk and turn the burner to low. Continue to stir the pasta until the pasta is tender and most of the milk has been absorbed (but still some left), 10 to 12 minutes (I cooked my pasta extremely low and slow, so it was upwards of 15 minutes.) Add more milk if your pasta isn’t cooked through. Once pasta is cooked, stir in the butternut squash puree, salt, pepper, and garlic powder. Continue to heat mixture over low heat (it helps if the squash is still a bit warm). Once mixture is hot, remove from heat, stir in the cheese, and taste to adjust seasonings as desired. + Recipe is a cross between my old butternut squash mac and cheese and White On Rice Couple’s Stove Top Version. My instructions are paired down because I never had trouble with the recipe but I would recommend popping over to their site to read through their detailed instructions.